This week, A.J. Kinik and Michelle Marek are guest-blogging here. They write the wonderful blog,"...an endless banquet." With the help of our friends here on the editorial board at Budget Travel, we managed to squeeze a whole heap of information into our "My Montreal is Better Than Yours" spread, but even so, the process was not without its casualties. It's tragic, but when all was said and done, we had a number of other hot Montreal tips (all food-related, naturally) that wound up on the cutting room floor. One of the benefits of doing a week of guest-blogging here at Budget Travel Online is that we get to make things "right", and throw a few more names and addresses your way. We were able to notify our cartographic division about some of these changes just before they went to press, so you'll even find some of these on your very own, handy-dandy, relatively accurate AEB Montreal maps. Part epicerie, part casse-croute, Ange & Ricky's simple but honest and delicious Haitian soul food definitely made it our number-one find of 2006. This is no-frills cuisine at its best: amazing stews, like their tassot (a jerked beef number), served with dirty rice and fried plantains in a take-away container to be taken away or eaten on premises. Recommended: tassot, fried chicken (served as a platter or by the piece), homemade lemonade with vanilla, and spicy Haitian-style cashew pralines. Downtown Montreal is a bit of a desert when it comes to good food at a reasonable price; Bangkok [pictured above] is something of an oasis situated in the most unlikely of locations: the food court of the somewhat ramshackle Le Faubourg shopping center. 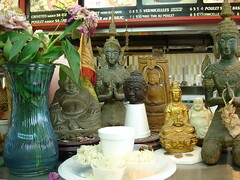 There, on the second floor, you'll find some of the very best Thai food Montreal has to offer for a song. Recommended: chicken tom yum soup, pad thai, shrimp with eggplant, and black pepper squid. For years, Byblos has not only had one of the most attractive, most inviting dining rooms in Montreal, they've also served some of the city's very best Persian cuisine. They're well known for their "Oriental" breakfasts, featuring homemade preserves, but we're especially fond of their "Dizzy," a traditional Persian stew they offer only on Sundays, their bewildering array of yogurt dips, and their fantastic tea and dessert service. These two St-Viateur cafes are two of the best Italian coffee bars in town and although there's more and more competition all the time, they continue to be the two most important social centers in Mile End. Many Mile Enders are partial to one or the other, but we like 'em both. Local folklore: You'll still hear the occasional Mile Ender refer to Cafe Olimpico as "Open Da Night" or "Open D." Don't get flustered; the reason for this is simple, if obscure: It's been gussied up since, but for a long time the only signage visible on the exterior was a weather-beaten painted window which had read "Open Day & Night," but was missing a couple of letters. Cafe Union is primarily a coffee roasting house, but they'll also make a fantastic cappuccino for you to have right there at the bar. At just a shade under 100 years old, they're probably the oldest coffee roasters in town, and they're definitely our favorite. Chez Jose is a quintessentially eccentric Plateau establishment that's known in particular for their empanadas (which are especially good with their house blend, chipotle-laced hot sauce) and their remarkable soup specials. The hearty seafood stew they offer on Fridays and Saturdays is not only the star of their line-up, it's quite frankly one of the city's hidden treasures. Located along an attractive stretch of Laurier just to the east of Parc Laurier, Le Fromentier is without question the finest artisanal bakery in town. Our favorites? Le Berlinois (with walnuts, caraway, and cumin--Wednesdays only), La Revolution Noire (dark chocolate, cocoa, and cranberries--Saturdays only), their baguettes, all their savory pasties, turnovers, quiches, and pizzas, and all their Viennoiseries. In other words, pretty much everything. They also have a fine cheesemonger, Le Maitre Corbeau, and an artisanal charcuterie, La Queue de Cochon, on premises. This one's a little pricier than most of our picks, but it's worth it because you won't find better sushi and sashimi anywhere else in town. Musts include the immaculate sashimi sampler, complete with five different types of fish, five different accompanying sauces, and five different garnishes, the spicy scallop rolls, and the delirious BBQ eel dynamite roll. Now, we could go on and on, but if you're searching for additional Montreal food & drink tips you need look no further than the "...an endless banquet" Montreal Food Guide (your guide to Montreal's best bakeries, barbecues, bars, bistros, boucheries, boulangeries, boutiques, brasseries, cafes, casse-croutes, charcuteries, chocolateries, delicatessens, depanneurs, epiceries, friteries, fromageries, luncheonettes, markets, microbreweries, patisseries, pizzerias, poissoneries, pubs, restaurants, rotisseries, tavernes, trattorias, etc. ), which now has well over 150 entries covering all styles, traditions, and price ranges. Earlier: Find This Just In's suggestion for what to see and do in three cool Canadian towns: Edmonton, Alberta; Saskatoon, Saskatchewan; and Charlottetown, Prince Edward Island.